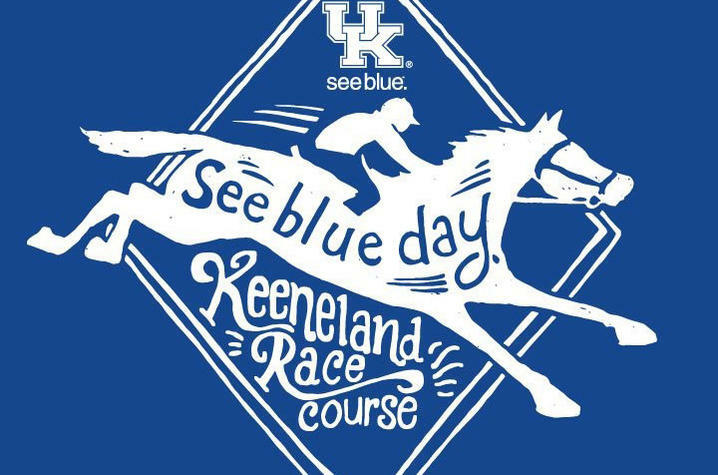 LEXINGTON, Ky. (Oct. 16, 2018) — Show Wildcat pride and wear blue to Keeneland Race Course for "seeblue. Day 2018" Friday, Oct. 19. General admission is free for University of Kentucky students, faculty, staff and alumni with a valid ID. Members of the UK Alumni Association may stop by the UK Alumni Association table outside the Keeneland gift shop beginning at 11 a.m. The first 200 members to show membership cards receive a free gift. There will be UK spirit-filled activities throughout the day, including a performance by members of the Wildcat Marching Band. Winner’s Circle recognition will feature the UK Band, UK Dance Team, UK DanceBlue and more. First post is 1:05 p.m.
Former UK football player Courtney Love, the 2018 Wuerffel Trophy winner, will be signing memorabilia from noon-2 p.m. Items will be available for purchase with proceeds benefiting DanceBlue. For more information, contact Sara-Elizabeth Bush at saraelizabeth.bush@uky.edu.